While individually microscopic, the chlorophyll they use for photosynthesis collectively tints the surrounding ocean waters, providing a means of detecting these tiny organisms from space with dedicated 'ocean colour' sensors, like Envisat's Medium Resolution Imaging Spectrometer (MERIS), which acquired this image on May 23, 2010, at a resolution of 300m. ...for monitoring the quality of coastal water. The Irish minister for Research and Innovation is supporting this initiative, in line with the country’s job creation priorities. The project, led by Ireland’s TechWorks Marine, working with Greek company Planetek Hellas, will combine satellite observations with data from ocean buoys to deliver timely, high-quality information for water and waste management operators. This initiative not only aims to improve water quality, but also provides a new opportunity for growth in Ireland. 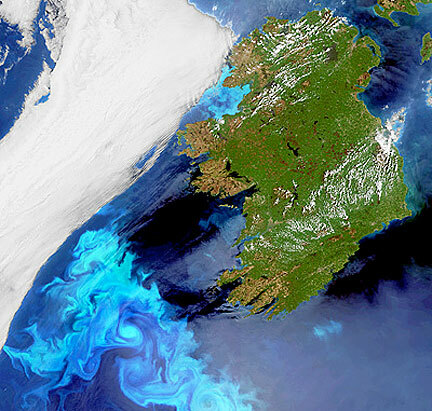 Ocean temperature in the Irish Sea as measured by satellites. 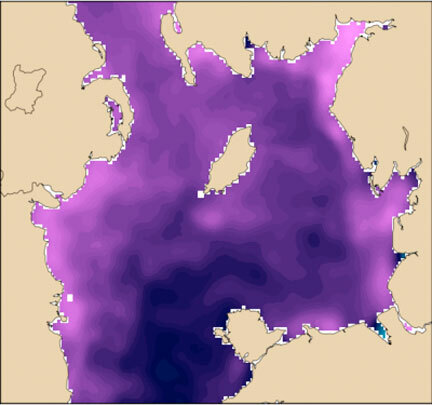 Light purple indicates cooler waters from the runoff along the coasts, while dark purple shows warmer waters. Initial service trials will be run in northwest Ireland’s Donegal Bay, where a large waste water treatment facility is operated by Veolia Water Ireland. Trials will also take place in the Middle East, where they operate major desalination facilities. Charlotte O’Kelly, Managing Director of Techworks Marine, noted that the project, which is jointly funded by the ESA Strategic Initiative and the Earth Observation Envelope Programme, wil,l in the future, rely on data from the Sentinel-1 and Sentinel-3 missions. The project, led by Ireland’s TechWorks Marine working with Greek company Planetek Hellas, will combine satellite observations with data from TechWorks’ own ocean buoys to deliver timely, high-quality information for water and waste management operators.